Never known for any spark of genius, Pakistan’s deposed and disgraced former PM, Nawaz Sharif seems set on a collision course with the very ‘democratic’ system he professes to be crusading for. Those with an eye on his three-decades-plus, though thoroughly un-inspirational, political career had fore-knowledge that Nawaz will not take the Pakistani apex court’s verdict against him with good grace. He doesn’t have the pedigree to be magnanimous in defeat. Son of a blacksmith from a village near Amritsar, in India, Nawaz was catapulted into political limelight via an act of patronage from a military colleague of Mohammad Zia-ul-Haq. General Ghulam Gilani, the then Punjab governor, wanted to payback for the ‘services’ rendered by the elder Sharif. Thrust on to the national stage without any tutoring or schooling, Nawaz has consistently behaved like a typical upstart in his entire leadership career. A woody man with no iota of charisma in his persona, Nawaz has all through his un-illustrious career tried desperately to dress himself up as a man of the masses, which he clearly isn’t. All that he represents is a class of exploiters—a cabal of feudal gentry in cahoots with industrialists and big business—who have used his cover to grow exponentially rich on, literally, the fat of the land; it’s a mafia he leads, as so aptly described by Imran Khan, Nawaz’s nemesis. In the wake of the apex court’s seminal verdict that booted him out of office, Nawaz decided to take his case to the ‘people’s court’ which he, erroneously, thought was all tilted in his favour. He has been on the offensive ever since, pretending to be ‘innocent’ and masquerading himself as the ‘victim’ of ‘a conspiracy’ hatched against him. Nawaz might think he can ingratiate himself with the people by pretending to be the victim of a ‘judicial coup’ which, as he has been fulminating, had been conceived against him by the powers-that-be before the top court took up his case. But that’s where Nawaz, apparently swayed by sycophants’ ill-advice that his people’s court was also studded in his favour, could be stepping into uncharted and dangerous territory. The insinuations from Nawaz and his loud-mouthed minions, wrapped in the enigma of a so-called ‘conspiracy’ against him, seem to suggest that the top judiciary was hand-in-glove with the powerful military brass in the plotting of his downfall. But all that is conjectural, wishful and not backed, one tiny bit, by facts on the ground, the so well-known objective realities of Pakistan’s corruption-riddled and nepotism-infested political culture. Yes, the men-in-khaki in GHQ and the men in black robes sitting on the Supreme Court could well be fed up with the corrupt ways and shenanigans of Nawaz and his cronies who have been helping themselves, with virtual impunity, to the country’s wealth and robbing it of every resource. But the generals, as of now, have no interest in upstaging the civilian-facade system and occupying the hot seat for themselves. They have no reason to, because their interest is under no threat in the present set-up where no civilian government would dare challenge their self-arrogated right to oversee the whole system and keep a sustained vigil on it. As for the Supreme Court, the judges couldn’t be more charitable to Nawaz and his children implicated in the Panama Papers for their ill-acquired wealth and money-laundering. Nawaz and his progeny have themselves to blame for their sad denouement because they wrapped themselves into umpteen knots by lying through their teeth and by presenting fake and forged documents before the court in their still-born attempt to prove their innocence. They are, to put it mildly, victims of their own legerdemain. Not content with his verbal offensive against a ‘biased’ court—which is a dangerous ploy and could drag him into contempt of court proceedings—Nawaz decided to put up a show of his popularity with the masses. His decision to travel from Islamabad to Lahore via the historic Grand Trunk (GT) Road, built by Sher Shah Suri in the 16th century, in a grand convoy of luxury cars was, at best, a stage-managed show of strength that impressed few outside the narrow corridor of upper Punjab in thrall of his thuggish cohorts. It wasn’t lost on a keen observer that Nawaz’s younger sibling, Shehbaz, has ruled the roost in Punjab for more than a decade and used it virtually as his family fiefdom. He’s more of a mafia don running the show with the help of a corrupt police force. For the bye-election to fill his vacant Assembly seat from Lahore, Nawaz has launched his wife, Kulsoom, to walk into his shoes. Many are likening it to what Lalu Prasad Yadav did in Bihar when faced with a similar predicament. But all agree that Nawaz wants to institutionalise nepotism by keeping power pegged in his own ‘dynasty’. 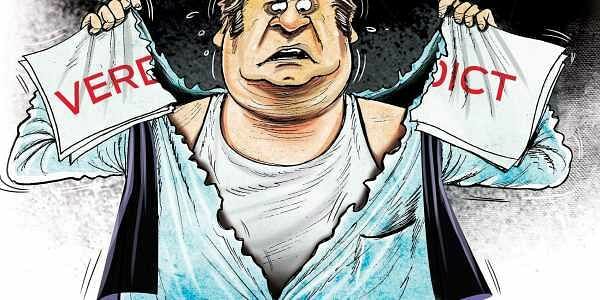 Nawaz’s end-game is clearly focused on fomenting chaos and anarchy in Pakistan, trigger a non-democratic change and go down as a ‘martyr.’ It’s a game fraught with trap-doors of all kinds. However, what Nawaz is apparently too befogged to think through is that the same people’s court he’s banking on may throw him out, warts and all, for his wholesale and wanton corruption at the next elections next year. The social media has got it right, already. On the eve of Pakistan’s 70th Independence Day, August 14, a pithy shibboleth said it all: ‘We got rid of goras (the Brits.) in 1947 and of chors (thieves) in 2017.